A drilling crew in Japan reported a similar successful operation two weeks earlier, on May 4 offshore the Shima Peninsula.For Japan, methane hydrate offers the chance to reduce its heavy reliance of imported fuels if it can tap into reserves off its coastline. Like Shale it is only a matter of time before it becomes commercially viable. But of course they should leave it under the sea because it might caus Climate Change. Sarc off. Given that CO2 is 0.04% of the atmosphere, talk of ‘flooding the atmosphere with climate-changing greenhouse gases’ seems a bit of a joke. But we’re used to such Hollywood-style hype from climate alarmists and their chums. If there is such a thing as a ‘greenhouse gas’ (when there isn’t even a greenhouse or equivalent) it’s mostly water vapour anyway. The percentage water vapor in surface air varies from 0.01% at -42 °C (-44 °F) to 4.24% when the dew point is 30 °C (86 °F)… Water vapor is also the most potent greenhouse gas owing to the presence of the hydroxyl bond which strongly absorbs in the infra-red region of the light spectrum. Upto ~106 times more water vapour than CO2. An interesting idea methane hydrate as a fossil. Tom – yes, Saturn’s methane-rich moon Titan does rather put the skids under the fossil claim. There’s a lot of it out there. At the same time, new technologies are being developed in Germany that may be useful for exploring and extracting the hydrates. 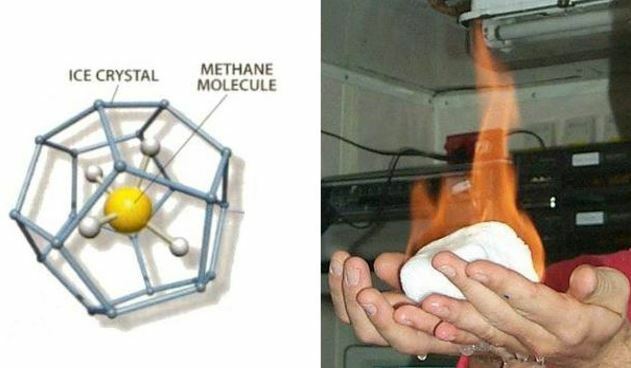 The basic idea is very simple: the methane (CH4) is harvested from the hydrates by replacing it with CO2. Laboratory studies show that this is possible in theory because liquid carbon dioxide reacts spontaneously with methane hydrate. 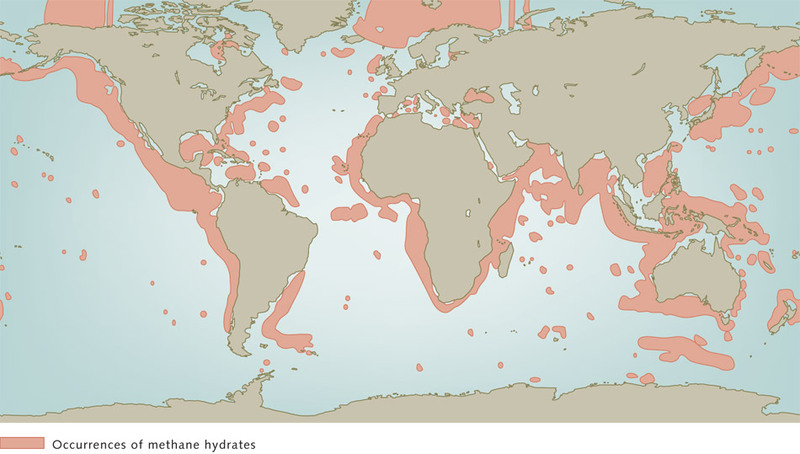 If this concept could become economically viable, it would be a win-win situation, because the gas exchange in the hydrates would be attractive both from a financial and a climate perspective. Is cost the main issue now?